Released on: December 6th , 2016. 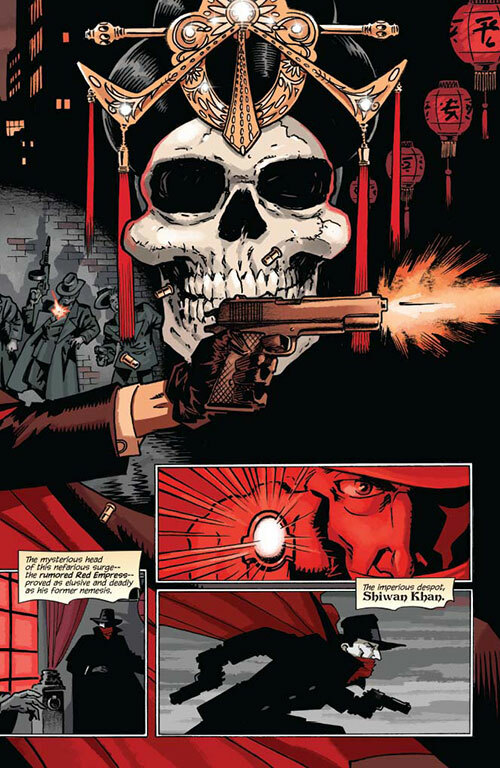 This five issue mini-series, written and illustrated by Matt Wagner (who previously did great things with the character in the recent Grendel crossover) begins when The Shadow’s assistant, Margo Lane, tells us that of all the cases she’s worked with her employer, the Case Of The Red Empress was the most devastating. From there we learn how violence among The Tongs in Chinatown had risen and despite his best efforts, The Shadow was unable to figure out why. Rumor has it that the person behind this surge in crime is known only as The Red Empress but she has so far proven quite illusive. 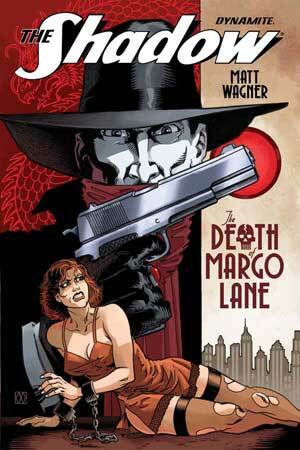 The Shadow realizes he has no choice but to trace this back to its root – China, and Margo accompanies him. But even here, they don’t find much more than an arcane warning from an old Chinese sage. On their return to the United States, they take a luxury cruise and discuss what little they know of the case. He theorizes to her that the dramatic way in which this Red Empress is making her moves may have more to do with trying to get attention than trying to take over the underworld. As they talk, they’re assault by two armed goons who really and truly have no idea who they’re messing with. They deal with them quickly and efficiently but The Shadow knows (ha!) that there’s more to this – if they were assaulted on the ship it means someone knows of their mission and his identity. Back in New York City the cops are trying to find out what happened to a missing shipping heiress named Gloria Sullivan. A reporter named Burke grills Inspector Cardona for details but gets only one – the last place she was seen was a restaurant in Chinatown. Burke, being one of The Shadow’s agents, reports back to his employer with the little news he has, that the cops aren’t yet treating this as a kidnapping even though all the evidence produced so far points in that direction. Property records indicate the restaurant she was last seen in was run by the Hip Sing Tongs, a faction The Shadow suspects are under control of The Red Empress. When The Shadow traces some inbound contraband to a warehouse owned by the Tongs, he realizes he’s being set up and drawn out, but he heads out to investigate anyway. The Shadow is behind bars, he’s addressed as Ying Ko by an emissary of the Red Empress. The Shadow knows how dangerous the Tong empire really is, how like a lot of immigrant groups they were forced to make a living in the criminal underworld to escape the pressures of racial prejudice and a society not quite ready to accept them. They’re holding Miss Sullivan for what they hope will be a hefty ransom from a family eager to see her returned unharmed. But just as sure as The Shadow is in the cage, The Shadow is not in the cage. The weed of crime bares bitter fruit, but the Tongs are ready for him. And well armed too, what with that oil drum full of TNT that they’re readying. Meanwhile, Margo Lane sits and waits, just like she always does. She and Shrevie are approached by a pair of thugs. Margo hides, Shrevie gets knocked out. These guys, who speak a foreign tongue, are trouble! But Margo, she knows how to handle herself and she’s good with a gun. A few bullets later and she’s making sure Shrevie is okay and ready to get him off to safety. She knows that those guys, they were Tongs – and there are a lot more on the way. As a firefight breaks out and The Shadow uses his cunning array of skills to make his own escape, Margo races towards him knowing full well those twin .45’s are going to be blazing like the fires of Hell. The Shadows makes his way out of the warehouse to Shrevie only to learn that Margo has gone in to save him – just as that TNT that was just planted erupts… No one could have survived that. After all, this is called The Death Of Margo Lane for a reason. The fight with the Tongs erupted in violence and the loss of life on both sides - and left The Shadow with more questions than answers. 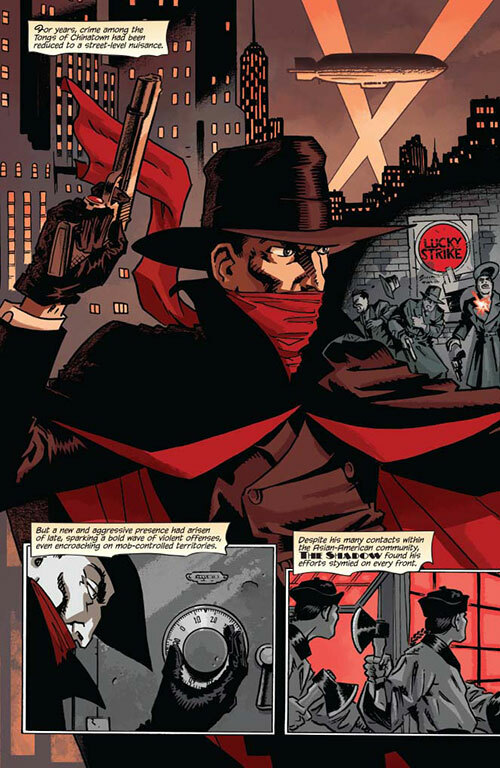 When this third issue begins, The Shadow intends to get some of those answers as the story opens with a scene where he attempts to interrogate Anthony Genovese. He wants to know more about his ties to the Red Empress. The mobster’s bodyguards open fire but are made short work of. Genovese pretends not to know anything, but The Shadow is smarter than that and once he raises a .45 to the mobster’s forehead, he drops the tough guy act and offers up everything he knows about their drug smuggling operation. Later that night at the illustrious Cobalt Club, Lamont Cranston approaches Commissioner Weston where he learns that the mayor won’t let the cops cleanup the Tongs in Chinatown so long as he’s trying to improve race relations in the neighborhood. Later still that same night, in New York’s Chinatown, The Shadow’s henchmen, Harry Vincent, Jericho Duke and Myra Reldon infiltrate the club known as The Shanghai Café, the Tongs’ base of operations. They kill the power just in time for their boss to arrive in hopes of finding the illusive Red Empress herself! 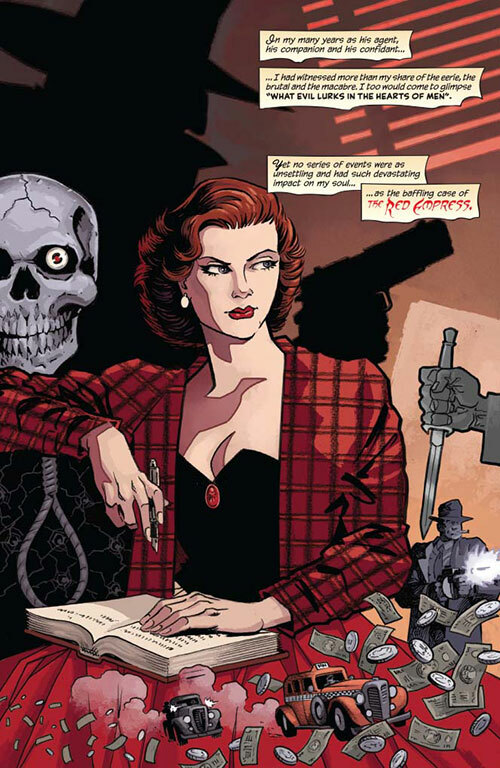 It all comes down to this, the fifth and final installment in Matt Wagner’s The Shadow – The Death Of Margo Lane five issue mini-series, one of the finest doses of pulp fiction mainlined to the comic buying public in a long, long time. She explains to The Shadow how Margo came to be in her employ, and then instructs her new minion to pull her blade from her sheath and attack ‘Ying Ko… The Defiler!’ Margo, clearly not operating under her own free will, does just that, though The Shadow, clearly still in love with her, tries his damndest to talk her out of this assault. Before his words can take effect, they’re assaulted by Empress Khan’s men. As her armed goons come into the chamber, The Shadow serves out justice from the barrel of a .45! But The Shadow, his feelings for Margo Lane… they’re more than just talk. If her life is on the line, will he really have what it takes to eliminate Khan and see that justice is truly served? Pulp fiction perfection, done right at the hands of an artist clearly in complete control of his chosen medium. Wagner’s no newcomer, he’s been doing this for a few decades now. He showed us in the Grendel/Shadow crossover what he could do with the character and in the last installment of this five issue series we get to see him cut loose. Free from the confines of the continuity attached to the Grendel series, with this run he gets to take The Shadow, an iconic character if ever there was one, in some decidedly new and interesting directions. This time around the cloaked vigilante’s quest is driven as much by love as it is by want for justice, but the end result, inevitably, is the same – the weed of crime bears bitter fruit! Wagner writes this well, conjuring up villains that are perfectly despicable so that when The Shadow, who really does operate in a bit of a grey zone, lays into them and serves out cold, hard, deadly justice… well, we’re on his side, not theirs. And yet, he feels. He loves Margo, and this complicates things, as love often does. This is not the type of territory we typically see the iconic character dragged through, but it sure does make for an interesting read. The artwork in this last chapter is just as good as it was in the first. Wagner’s a master of art deco backgrounds and costuming and given that this is a period piece, he gets ample opportunity to run rampant with this. Lots of detail, lots of style, some great action set pieces conveyed not with over the top theatrics but shadow, light, composition and taste. It’s a beautiful thing, a wonderfully appropriate finish to a comic that has somehow subscribed to the old methods while managing to breathe new life into the medium. In addition to collecting the five issues of this min-series, this trade paperback edition also includes a prose story by Wagner called The Curse Of Blackbeard’s Skull. Accompanied by some illustrations, also by Wagner, this originally appeared in The Shadow #100.